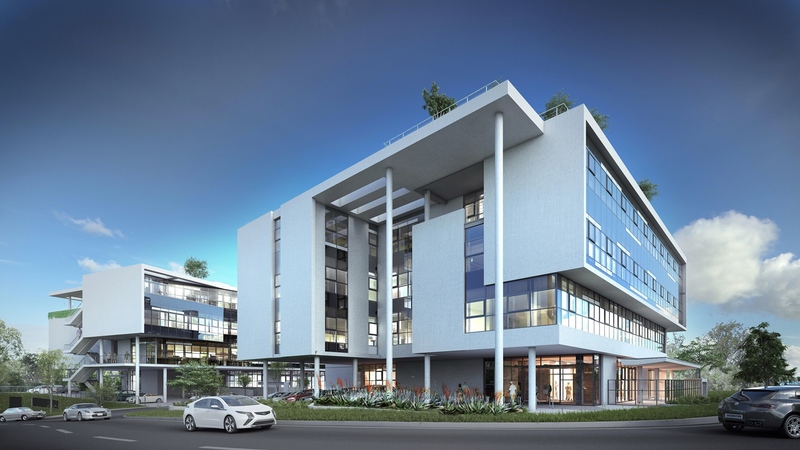 Located on the corner of January Masilela Drive and Amarand Avenue, Pegasus forms part of an integrated multi-use development comprising retail, office, residential, leisure and entertainment offerings. Menlyn Maine itself is targeting a rating for each building, and intends to pursue a Green Star SA Communities Pilot rating for the precinct as a whole. All the buildings in the precinct are being designed on sustainable building principles with a particular focus on water and energy saving as well as improved public transport and waste management. 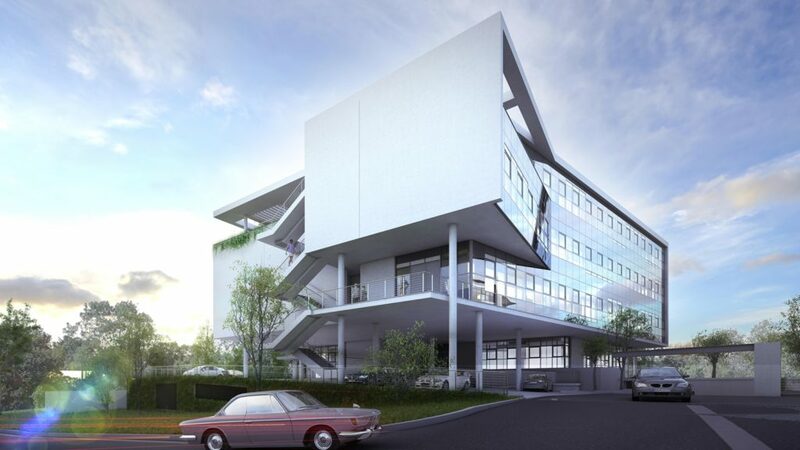 The Pegasus building, owned by Menlyn Maine Investment Holdings and Fast Motion Trade and Invest, comprises approximately 6192 m² usable office area for the combined Phase 1 and Phase 2 office blocks on a 4445 m² site; and houses tenants such as Regus, BMW and Menlyn Maine Investment Holdings’ head office. Sustainability initiatives were considered from the schematic design phase through to construction completion and building services have been optimised to improve building performance. The building is ideally located in walking distance from a wide variety of local amenities and public transport services, and it is easily accessible via the regular Gautrain bus service that links it to a greater transport network. To encourage the use of alternative forms of transport, 5% of preferred parking bays have been dedicated for alternative fuel and hybrid vehicles and 5% for motorbikes, mopeds and scooters. Tshwane’s Bus Rapid Transit system will also serve the precinct, once the Menlyn A Re Yeng bus station is completed. Passive design initiatives include the building orientation and sizing of the floorplates for optimal daylighting of interior spaces. Indoor Environmental Quality was a major consideration, and fresh air intake in the building has been improved by 100% over the SANS 10400-O requirement of 5 litres/second/person for offices. Over 80% of the office area has a direct line of sight to the outdoors, while internal blinds and screens are used throughout the building to reduce daylight glare. A water-saving strategy has been implemented in the whole building with water-efficient fittings and waterless urinals installed. Potable water consumption for landscape irrigation has been reduced by more than 50% through drip irrigation and rainwater harvesting from the site and building hard surfaces. The project also achieved points for making use of mechanical systems that do not rely on water consumption for heat rejection – and the fire-protection system was designed to ensure that the minimum amount of water is rejected during the inspection of these systems. Energy sub-metering is implemented for all major or substantive energy uses within the building and a BMS was installed for monitoring energy and water consumption. In addition, a Building User’s Guide was developed in close cooperation with the design professionals to advise building occupants on the efficient operation of systems. To reduce carbon emissions associated with the project, all HVAC refrigerants and gaseous fire suppression systems used have an Ozone Depletion Potential (ODP) of zero – and no ozone-depleting substances are associated with either the manufacture or the composition of any thermal insulants in the project. The project has reduced the absolute quantity of Portland cement, as an average across all concrete mixes, by substituting it with industrial waste products or oversized aggregate by 20% as an average across all concrete mixes. More than 30% of the total PVC content has been replaced by alternative materials, mainly HDPE – and the recycled content across all steel in the building is more than 54%. During construction, the contractor developed, implemented and monitored a project specific Environmental Management Plan that included a Waste Management Plan, tracking all waste streams and completing quarterly reports on waste generation, recycling and reuse. A total of 70% of all waste was recycled or reused. 90% of the Usable Area of the project is delivered as shell and core, allowing tenants to complete their own fit-out. This reduces unnecessary waste that would normally accompany tenant fit-out where the base building includes finishes. In terms of waste management during operations, a dedicated adequately sized storage area has been provided for the separation and collection of office consumables, with good access for all building occupants and for collection by recycling companies. As the first building registered for a Green Star SA rating, Menlyn Maine Pegasus is succeeding in setting new benchmarks in its sector.